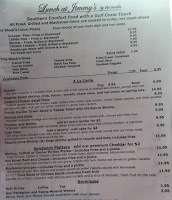 After a long day of moving boys into their college homes, we were starving and trying to decide what we wanted to eat. 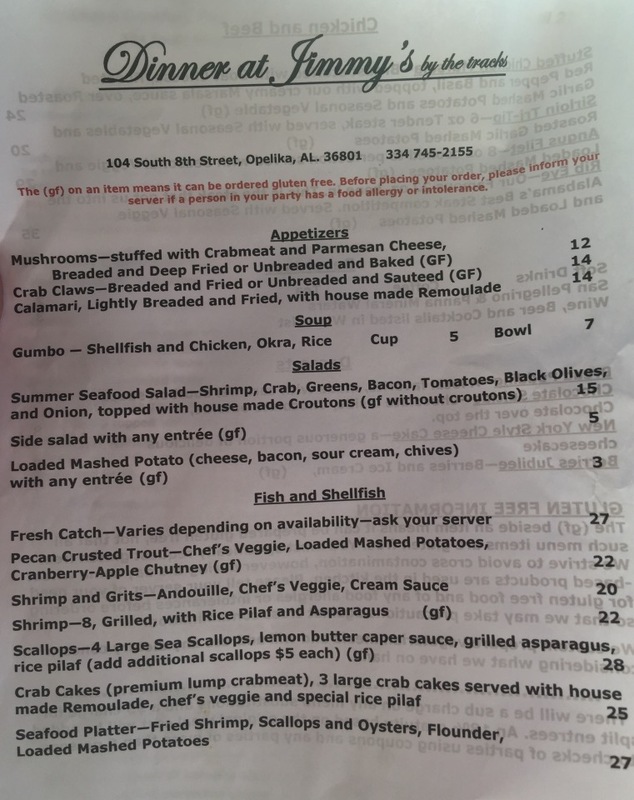 I had picked a couple of new restaurants in Opelika that sounded interesting, one Mexican and the other Cajun. Rob, who is on a Cajun kick lately, settled that decision, so Jimmy's at the Tracks was our choice. 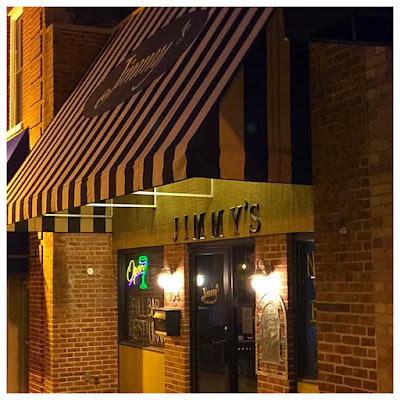 I had no idea what to expect, but Jimmy's had good reviews online and they have also recently been nominated as having one of the best steaks in the state. We headed to Opelika and, sure enough, found Jimmy's downtown just across the railroad tracks. Now remember, we had been working all day. We were hot, tired, hungry and very casual, so when JD opened the front door of Jimmy's, he was a little surprised. 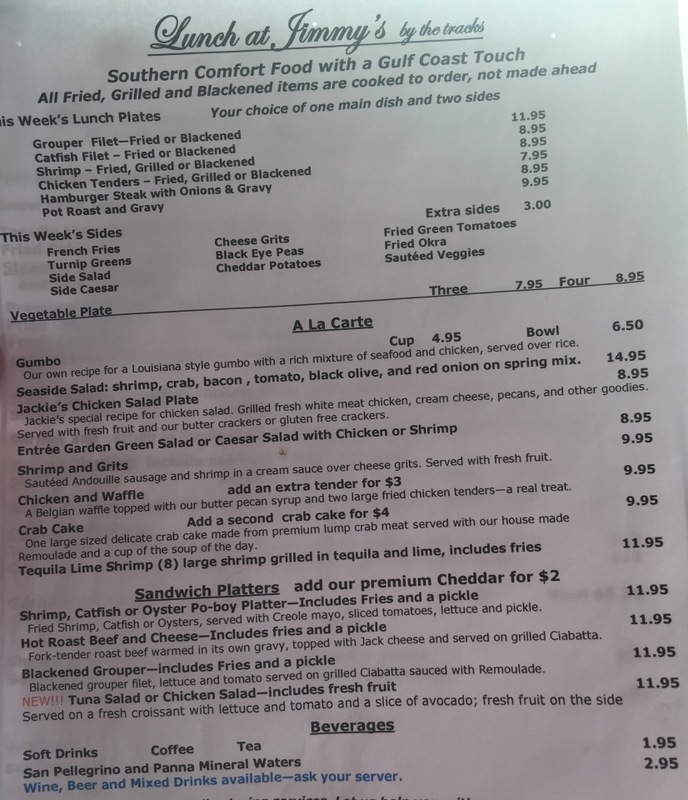 We had a restaurant along the lines of Wentzell's or Cajun Steamer in the back of our minds. What he saw was white linen tablecloths and fine china. That was just the first surprise. With dishes like shrimp and grits, crab cakes and bread pudding on the menu, Jimmy's definitely has Cajun/Creole flavor, but it is so much more. 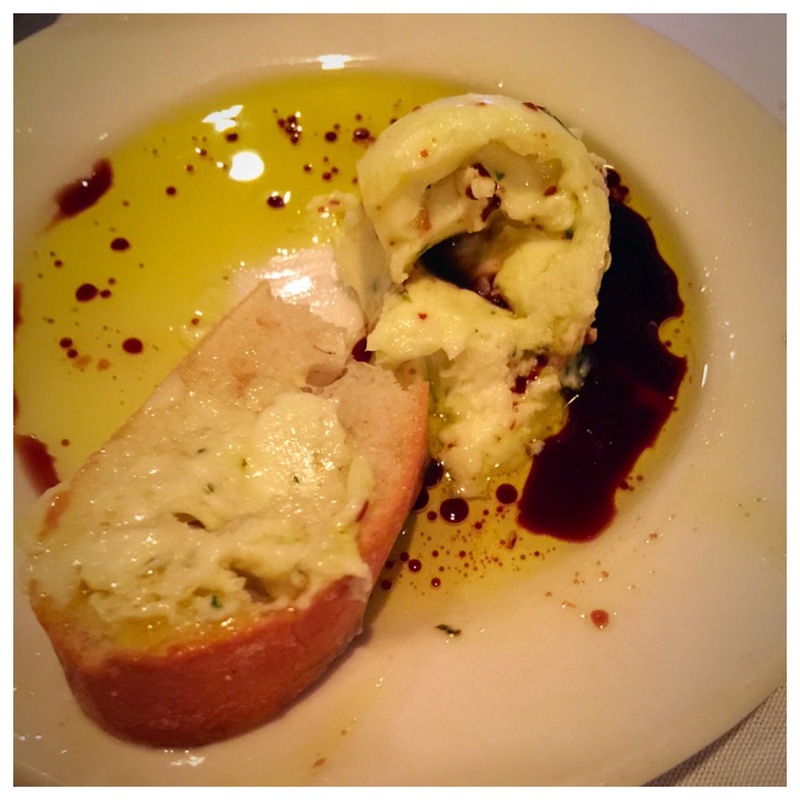 For instance, many restaurants bring a bread basket with flavored olive oil for dipping. Jimmy's does too, but a giant dollop of fresh butter is plopped in the middle of a mixture of olive oil and balsamic vinegar. We looked like four hungry wolves as we quickly polished off that bread. We chose to begin with an appetizer of fried calamari. It arrived just as soon as the bread disappeared. It came with two dipping sauces, a fresh marinara and a spicy remoulade. 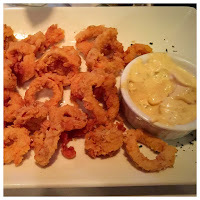 The calamari was expertly cooked, crispy and delicious with the homemade sauces. There wasn't a crumb left! There were three steaks on the menu, but the one which earned Jimmy's a best steak in Alabama nomination was a 22 oz. bone-in ribeye. Rob, our carnivore, immediately went to that item, but the size of the thing was a bit daunting to him. 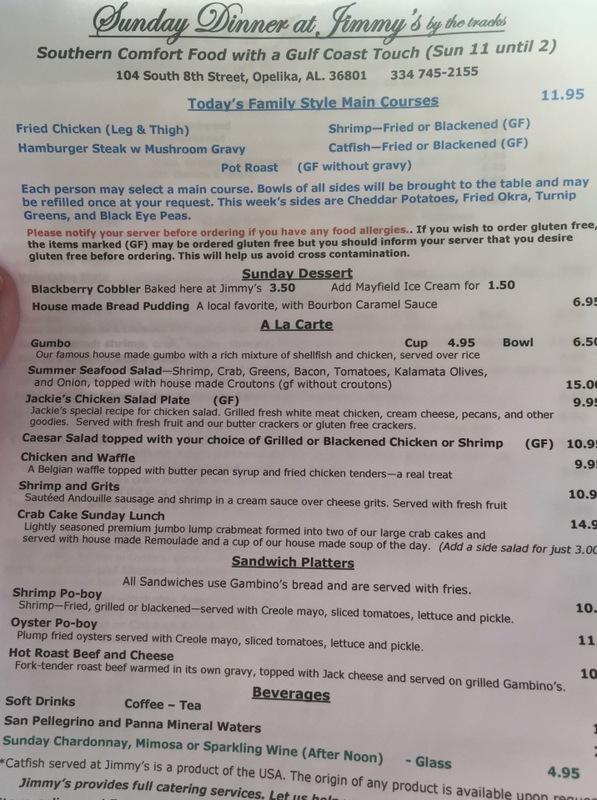 JD was thinking about the fresh catch, which we thought was snapper, but we must have misread the board next to the hostess station, because it turned out to be salmon. 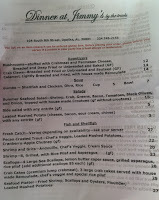 Scott considered the fresh sea scallops and I thought about the crab cakes. Rob finally threw caution to the wind and settled on his first choice, the ribeye...all 22 ounces. 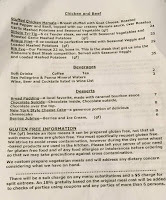 JD, when he heard salmon rather than snapper, decided that bone in the ribeye was going to be taking up several ounces, so he, too, chose the ribeye. 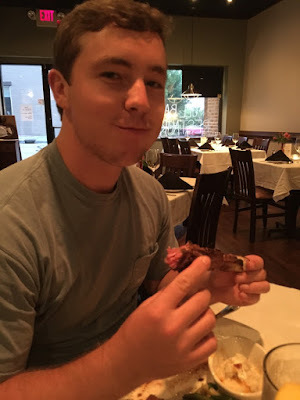 JD loves salmon, but honestly, that best steak in Alabama nomination was hard for him to pass on. The ribeyes that came out of Jimmy's kitchen did not disappoint. 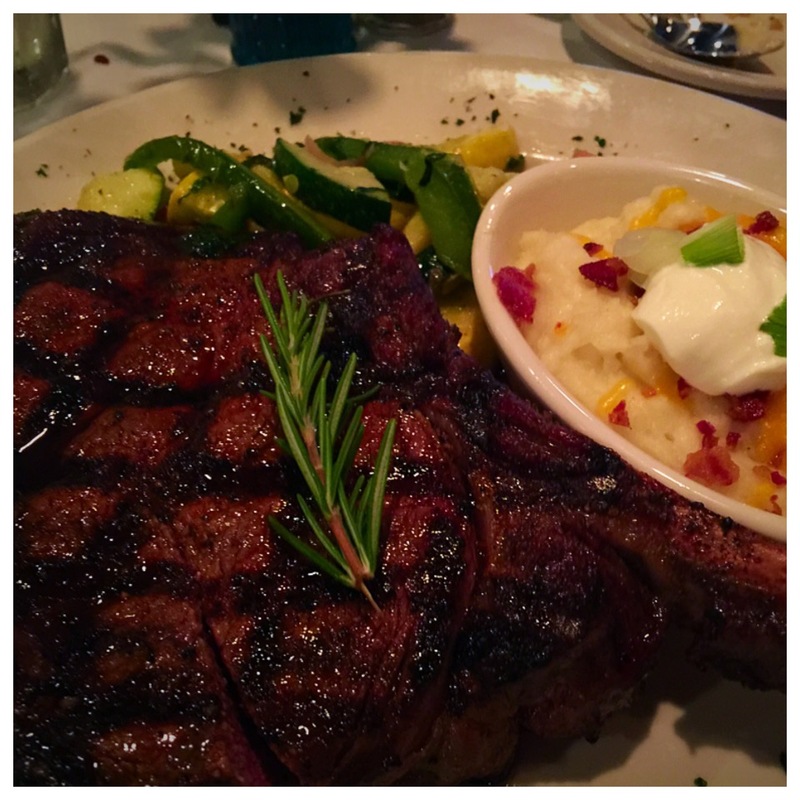 Both boys gigantic medium rare steaks were accompanied by grilled veggies and creamy, garlic mashed potatoes, topped with sour cream, green onions and crumbled bacon. Scott's choice ended up being grilled shrimp with rice pilaf and grilled asparagus. 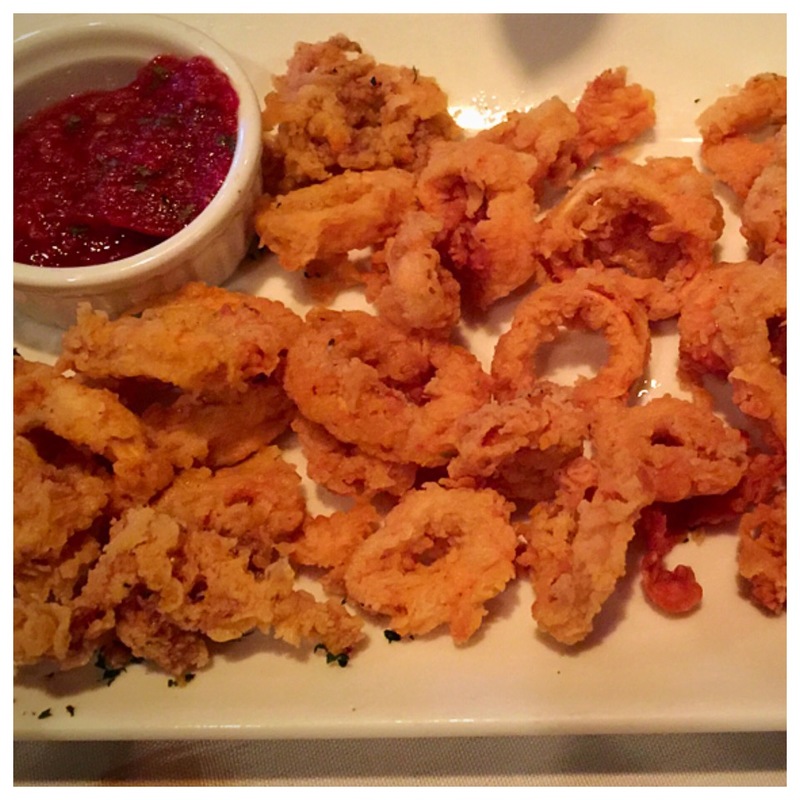 He had eight huge shrimp, but they were looking much more manageable than those two enormous ribeyes! 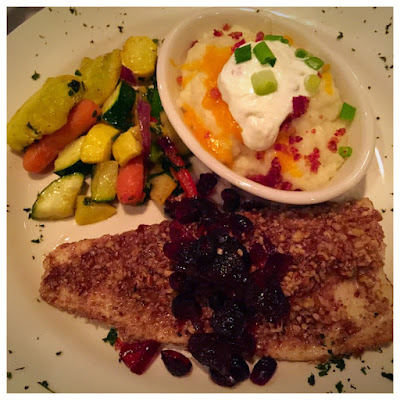 I, finally, after much debate, decided to go with the pecan crusted trout served with cranberry apple chutney, grilled veggies and those same creamy mashed potatoes the boys received. I also chose to add a cup of chicken and shellfish gumbo. 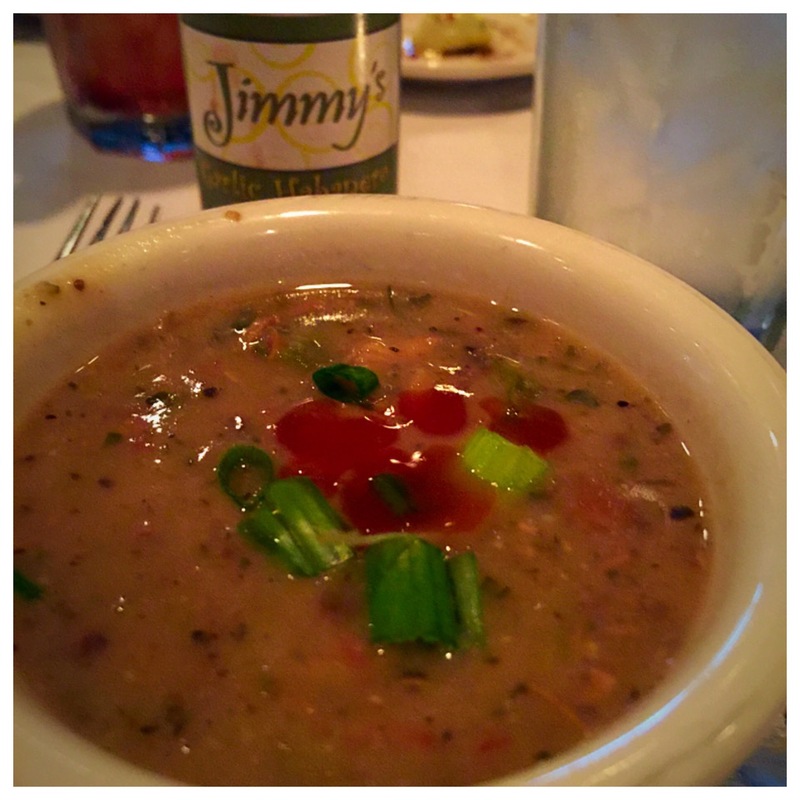 The gumbo arrived with a bottle of Jimmy's own hot sauce, which I promptly sprinkled into the bowl. I loved Jimmy's hot sauce and it was delicious in the hearty gumbo. It was a very good cup of gumbo, neither too spicy nor too bland. Even though my favorite gumbo is all seafood with big chunks of shrimp and crab, this chicken and shellfish gumbo was lively and rich. My trout reminded me of the first Thanksgiving. Seriously, I felt like one of Wampanoag's had caught a fresh trout from a nearby bubbling stream, coated it in pecans foraged from the forest, sautéed it over hot coals and topped it with chopped cranberries and apples. Okay, I am sure these cranberries were much sweeter and tastier than the ones at the Plimoth Plantation meal, but you get the idea. I ate every crumb of that nutty trout and the sweet and tangy cranberry apple chutney was the perfect counterpoint. The creamy, loaded mashed potatoes and the grilled veggies equaled a perfect meal for which I found myself giving thanks, even in the middle of August. My partners in crime were giving the same kind of accolades to their meal choices. 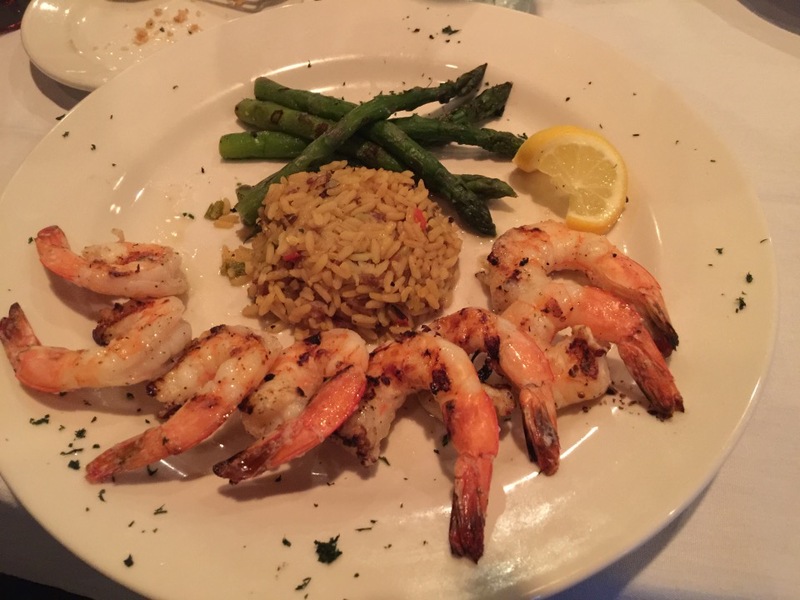 Scott said his shrimp were delicious and perfectly cooked. He ate every bite of his rice pilaf and asparagus, as well. As for the best steak in the state nominee? It lived up to every bit of the hype. JD let me have a taste of his ribeye and I was amazed. I cannot imagine a steak being anymore flavorful or tender than this one. I am not a huge steak eater, but I think I could have made a huge dent in this massive hunk of beef. The boys and Scott were equally impressed. While Rob ended up taking some of his steak home with him, JD could not stop eating. He gnawed that meat right down to the bone. I was praying I didn't start hearing bone-sucking sounds coming from his side of the table. You thought I was kidding, didn't you? That ribeye bone in JD's hands is all that was left of that huge steak. My boys also completely polished off their mashed potatoes and vegetables. In fact, JD asked our host if Jimmy's had also been nominated for best mashed potatoes in the state. 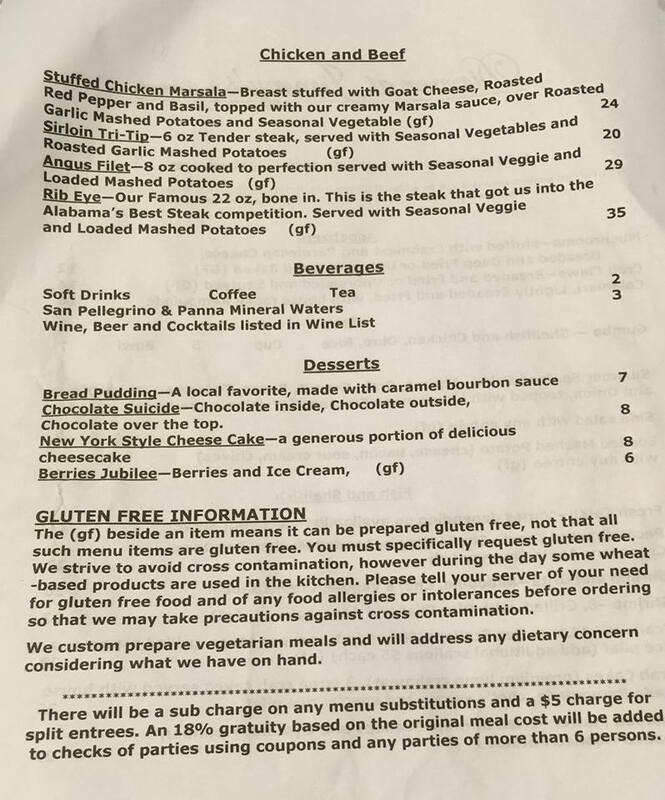 Y'all, this was one fine meal, but we could not leave without sampling at least one dessert, so we ordered one bread pudding to share. Oh. My. Gosh! 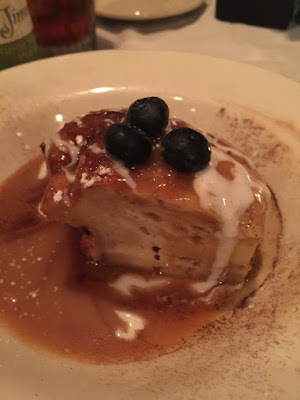 Jimmy's bread pudding is one of the best I have ever had. It was lighter and less dense than most bread puddings. Topped with a caramelly bourbon sauce, it was a delicious end to a delightfully surprising meal. 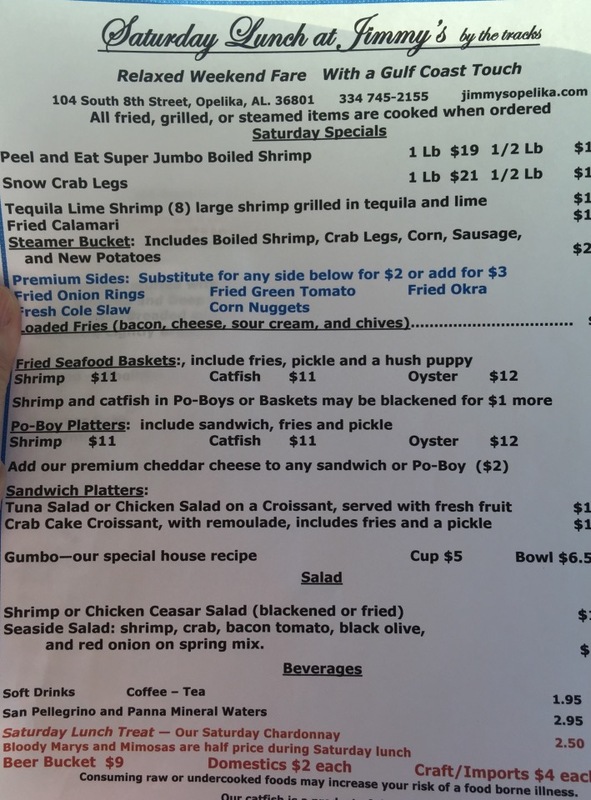 We went into Jimmy's expecting casual Cajun and we got so much more. 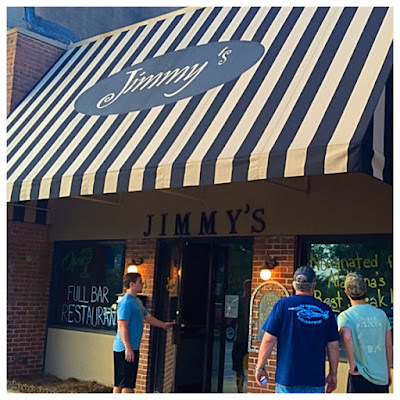 If you are ever in Opelika, you should absolutely stop by and see Jimmy and friends. It was truly one of the best meals we have had and we will most definitely be back. 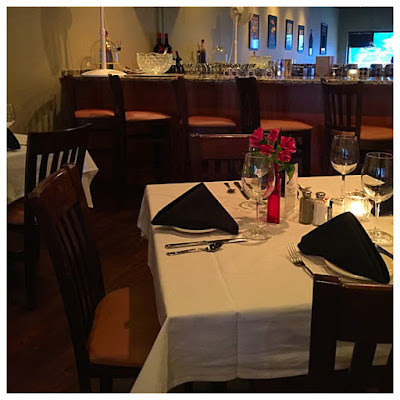 You can keep up with the Best Steak in Alabama at www.alabamasbeststeak.com. I have no idea who will win, but if their steak is better than Jimmy's, I can't even imagine! Three Friends and a Fork are happy to give Jimmy's at the Tracks 3 HUGE Yums UP! Note: On our next trip to Jimmy's, we have our sights set on Jimmy's chicken and waffles topped with butter pecan syrup. Does that not sound divine? ?